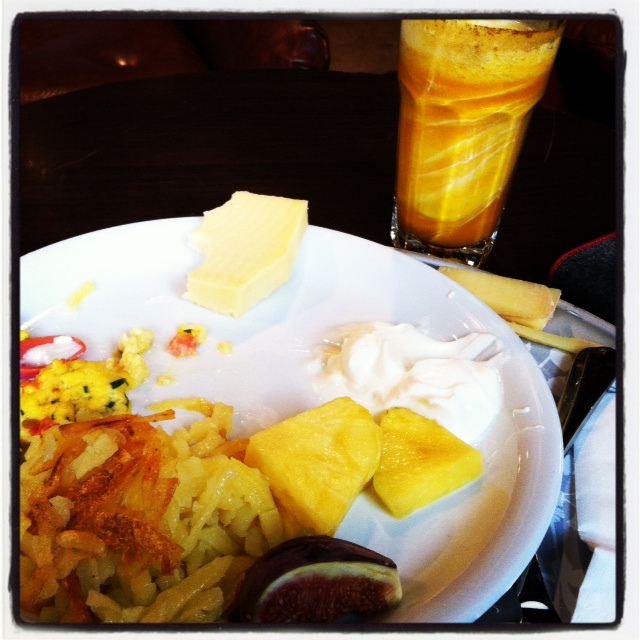 Today we had breakfast at Hiltl, Mum and Dad’s favorite restaurant in Zurich. It’s always a lot of fun for me too as there is so much to see, people to charm and flirt with, food to try… nam nam (my word for food). Mum sat me in a child seat so I wouldn’t be crawling all over her or Dad or trying to get on the auspiciously interesting floor. I might have been able to find some interesting food scraps – an idea which Mum didn’t like… Anyway, in my chair I was, full view of the buffet, people and everything interesting. Food was yummy, much more interesting than the stuff they feed me at home. Especially when Mum fed me MANGO LASSI through a straw! You can see it in the background. This entry was posted in adventure, mum and dad, nam nam and tagged baby food, Baby walking, bottle, breakfast. Bookmark the permalink.